How good's your Insta game? It's a week til camping at Splendour! Who do you tell? Your Insta bio needs a makeover - what's in it? Name, age, location, fun facts - I love a long bio! You get a DM from someone cute, but you're not sure if you've met before...? You really want to be an Influencer, so you've gotta get that follower count up! How do you do it? It's time to go viral! I'm going to include my address - I might get sent free things to unbox! You're having a house party, how do you let everyone know? Post it on my insta for everyone to see! 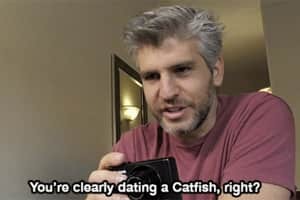 Oh dear, have you been catfished? So... the person you've been talking to isn't who you thought they were! They knew so much about you... but it's not too late to back out! If you're sure they're catfishing you, you can always report the account - first to the social media service where it happened, then to eSafety if it's not resolved in 48 hours. Boom. A SWAT team's just busted down your door! Probably shouldn't have given all that information out on Twitch... not to mention all your other accounts. You probably shouldn't have your address available to randoms, but you'll know for next time! Those are your photos and that's your name... but you didn't create that account. People can learn sooo much about you through social media, so in this day and age, it's better to play it safe and keep those accounts on private!